Smart Emails allows to modify the look and style of the WooCommerce emails that are send to customers using WordPress Customizer. Send beautiful emails and create a more customized experience for your customers. Uses built-in WordPress cutomizer to customize your WooCommerce emails. 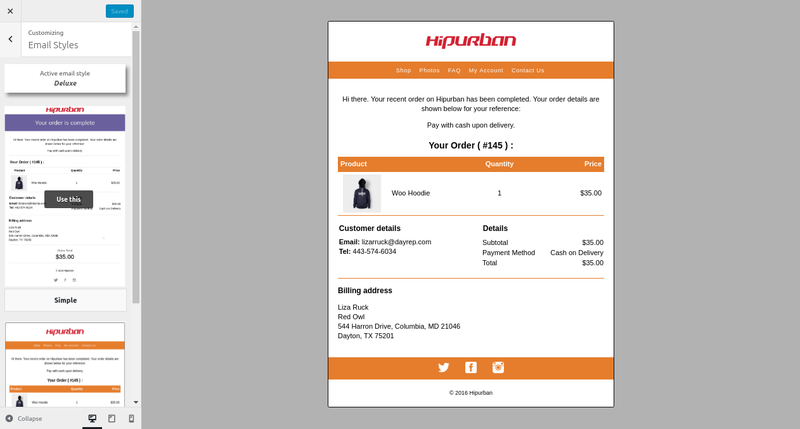 Live customization and preview of WooCommerce emails that are send to users. Beautiful emails styles to choose from. Can customize the text content of the emails. Different customization options for each style. Send test emails of the currently previewed template. Email Styles section allows you to choose email style that will be used for all of your emails send from WooCommerce. It shows you the currently active style that you are using and list of available styles.